The survival of a surveyor's level from the 16th century is very rare. This example works by part filling the V-shaped trough with water and, when the inclination of the trough has been adjusted by the action of the cranked handle so that the readings on two short vertical scales at either end are the same, sighting through the instrument gives the surveyor the level. The survival of an original tripod is also very unusual. 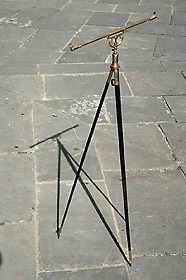 The instrument can be taken off its mount and the wooden legs of the tripod folded to a circular section and clamped by two brass rings, so as to be easy to carry. The construction of this instrument is hardly in keeping with the robust character usually demanded of a surveyor's level.